THE GOOD STORY OF THE CONCORDE CRASH December 9, 2012 LAST WEEK, A FRENCH APPEALS COURT overturned a manslaughter conviction against Continental Airlines for its role in the crash of an Air France Concorde outside Paris twelve years ago. Flight 4590 was a charter destined for New York’s JFK airport on July 25th, 2000, carrying mostly German tourists headed to South America. As it neared takeoff speed, the Concorde struck a thin metal strip on the runway, causing one of its tires to burst. The strip had fallen from the underside of a Continental Airlines DC-10 that had departed minutes earlier, bound for Houston. Chunks of the burst tire impacted the Concorde’s wing at tremendous velocity, resulting in a powerful shock wave within the wing’s fuel tank that ultimately punctured it. Gases from the engines then ignited leaking fuel, touching off a huge ﬁre. The crew wrestled the crippled jet into the air, but lost control moments later, slamming into a hotel. All 109 passengers and crew perished, as did four people on the ground. All along, conventional wisdom, bolstered by lethargic media coverage, has held that the fuel tank ﬁre was the direct cause of the crash. This from the Associated Press a few days ago, is a typical example of what the public has been reading and hearing: “The burst tire sent bits of rubber ﬂying, puncturing the fuel tanks, which started the ﬁre that brought down the plane.” But this isn’t so. There’s no denying the jet ran over an errant piece of metal that caused a tire explosion and a resultant ﬁre. But while the ﬁre was visually spectacular — caught on camera, it trails behind the plane in a hellish rooster tail — experts say that aside from damaging the number 2 engine, it was very much survivable, and likely would have burned itself out in a matter of a few minutes. Not only was it survivable, but it was probably avoidable as well, had it not been for a chain of errors and oversights that, to date, nobody wants to talk about — particularly not European investigators. The plane went down not because of any ﬁre, directly, but because 1., it was ﬂying too slowly; 2., it was several tons overweight and beyond its aft center of gravity limit; 3., two of its four engines were damaged or erroneously shut down. It was ﬂying too slowly because the pilot at the controls, Christian Marty, had pulled the jet into the air to avoid skidding sideways off the runway and colliding with another plane. Why it was skidding has been the subject of contention, but as we’ll see in a minute, many believe the skid was caused by an improperly repaired landing gear. Under normal circumstances Marty still had enough speed to climb away safely; however, he no longer had enough power. One engine had been badly damaged due to ingestion of foreign material — not only pieces of exploded tire, but debris from a runway edge light the jet had run over during the skid. A second engine, meanwhile, was shut down completely by the cockpit ﬂight engineer — at a time and altitude when he was not supposed to do this, when remaining thrust from that engine was desperately needed for survival. All the while, the plane was an estimated six tons above its maximum allowable weight based on wind conditions at the time of the crash. At proper weight, the jet would have become airborne prior to the point when it ran over the metal strip. 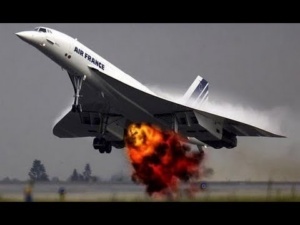 Doomed: THE REAL STORY OF FLIGHT 4590 David Rose It is an indelible image, heavy with symbolism: the photograph taken on 25 July 2000, at the moment Concorde became a technological Icarus. The great white bird rears up over runway 26 at Charles de Gaulle, immediately after takeoff. Already mortally wounded, ﬂames bleed uncontrollably from beneath the left-hand wing. Less than two minutes later, the world’s only supersonic airliner will ﬂing itself into the Paris suburb of Gonesse, killing all 109 on board and another ﬁve on the ground. The ofﬁcial investigation has focused almost entirely on the ﬁre. According to the French accident investigation bureau, the BEA, it broke out when the plane passed over a strip of metal on the runway. A tyre burst; a chunk of rubber thudded into a fuel tank inside the wing; jet fuel poured out of a hole and ignited. The hot gases caused two of the engines to falter, and despite a valiant struggle by Captain Christian Marty, a daredevil skier who once crossed the Atlantic on a windsurf board, the loss of thrust made the crash inevitable. An investigation by The Observer suggests the truth is much more complicated. In the words of John Hutchinson, a Concorde captain for 15 years, the ﬁre on its own should have been “eminently survivable; the pilot should have been able to ﬂy his way out of trouble.” The reason why he failed to do so, Hutchinson believes, was a lethal combination of operational error and negligence. This appears to have been a crash with more than one contributing factor, most of which were avoidable. Go back to that photograph. An amazing picture: but where was it taken? The answer is: inside an Air France Boeing 747 which had just landed from Japan, and was waiting to cross Concorde’s runway on its way back to the terminal. Its passengers included Jacques Chirac and his wife, the President and ﬁrst lady of France, returning from the G7 summit. Concorde looks to be nearby because it had been close to hitting the 747, an event which would have turned both aircraft into a giant ﬁreball. Veering wildly to the left, like a recalcitrant supermarket trolley with a jammed wheel, Concorde’s undercarriage had locked askew. When Marty pulled back on the control column to raise the nose and take to the air — the process pilots call “rotation” — the plane’s airspeed was only 188 knots, 11 knots below the minimum recommended velocity required for this manoeuvre. But he had no choice: the plane was about to leave the tarmac altogether and plough into the soft and bumpy grass at its side. That might have ripped off the landing gear, leaving Concorde to overturn and blow up on its own. If not, the 747 lay straight ahead. So he took to the air, although he knew he was travelling too slowly, which would impair the damaged plane’s chances of survival. Shocking evidence now emerging suggests that the Air France Concorde F-BTSC had not been properly maintained. The airline’s ground staff had failed to replace a “spacer” — a vital component of the landing gear which keeps the wheels in proper alignment. Although the BEA disputes it, there is compelling evidence that it was the missing spacer which may have caused the plane to skew to the left, so forcing Marty to leave the ground too early. At the same time, the plane was operating outside its legally certiﬁed limits. When it stood at the end of the runway, ready to roll, it was more than six tonnes over its approved maximum takeoff weight for the given conditions, with its centre of gravity pushed dangerously far to the rear. Even before the blowout, Marty was already pushing the envelope. The stresses on Concorde’s landing gear are unusually severe. At regular intervals, the various load-bearing components become “lifed” and must be replaced. When the undercarriage bogeys are taken apart and reassembled, the work must be done according to a rigid formula, and rigorously inspected and assessed. Concorde F-BTSC went into the hangar at Charles de Gaulle on 18 July, a week before the crash. The part which was lifed was the left undercarriage beam — the horizontal tube through which the two wheel axles pass at each end. In the middle is a low-friction pivot which connects the beam to the vertical leg extending down from inside the wing. The bits of the pivot which bear the load are two steel shear bushes. To keep them in position, they are separated by the spacer: a piece of grey, anodised aluminium about ﬁve inches in diameter and twelve inches long. When the plane left the hangar on 21 July, the spacer was missing. After the crash, it was found in the Air France workshop, still attached to the old beam which had been replaced. In the days before the accident, the aircraft ﬂew to New York and back twice. At ﬁrst, the loadbearing shear bushes remained in the right positions. But the right-hand bush began to slip, down into the gap where there should have been a spacer. By the day of the crash, it had moved about seven inches, until the two washers were almost touching. Instead of being held ﬁrmly in a snugﬁtting pivot, the beam and the wheels were wobbling, with about three degrees of movement possible in any direction. As the plane taxied to the start of the runway, there was nothing to keep the front wheels of the undercarriage in line with the back. The supermarket trolley was ready to jam. Exactly when it started to do so is uncertain. Jean-Marie Chauve, who ﬂew Concordes with Air France until his retirement, and Michel Suaud, for many years a Concorde ﬂight engineer, believe the undercarriage was already out of alignment when the plane began to move down the runway. They have spent the past six months preparing a 60-page report on the crash. Chauve said: “The acceleration was abnormally slow from the start. There was something retarding the aircraft, holding it back.” Chauve and Suaud’s report contains detailed calculations which conclude that without this retardation, the plane would have taken off 1,694 metres from the start of the runway — before reaching the fateful metal strip. The BEA contests these ﬁndings, saying that the acceleration was normal until the tyre burst. It also maintains that even after the blowout, the missing spacer was insigniﬁcant. The extra weight had a further consequence beyond simply making it harder to get into the air. It shifted the centre of gravity backwards: the extra bags almost certainly went into the rear hold, and all the extra fuel was in the rearmost tank. A plane’s centre of gravity is expressed as a percentage: so many per cent fore or aft. Brian Trubshaw and John Cochrane, Concorde’s two test pilots when the aircraft was being developed in the early 1970s, set the aft operating limit at 54 per cent — beyond that, they found, it risked becoming uncontrollable, likely to rear up backwards and crash, exactly as Flight 4590 did in its ﬁnal moments over Gonesse. The doomed plane’s centre of gravity went beyond 54 per cent. The BEA states a ﬁgure of 54.2 per cent. A senior industry source, who cannot be named for contractual reasons, says the true ﬁgure may have been worse: with the extra fuel and bags, it may have been up to 54.6 per cent. And as the fuel gushed from the hole in the forward tank, the centre of gravity moved still further back. When the plane was just 25 feet off the ground, Gilles Jardinaud, the ﬂight engineer, shut down the ailing number two engine. Both French and British pilots say it was another disastrous mistake, which breached all set procedures. The engine itself was not on ﬁre, and as the tank emptied and the ﬁre burnt itself out, it would probably have recovered. The ﬁxed drill for shutting down an engine requires the crew to wait until the ﬂight is stable at 400 feet, and to do so then only on a set of commands from the captain. In a comment which might be applied to the whole unfolding tragedy, John Hutchinson said: “Discipline had broken down. The captain doesn’t know what’s happening; the co-pilot doesn’t know; it’s a shambles.” Previous reports of the tragedy have described the crash as an act of God, a freak occurrence which exposed a fatal structural weakness in the aircraft which could have appeared at any time. The investigation by The Observer suggests the truth may not only be more complicated, but also sadder, more sordid. Men, not God, caused Concorde to crash, and their omissions and errors may have turned an escapable mishap into catastrophe. The issues raised by David Rose, which at ﬁrst were dismissed as so much conspiracy mongering, are now generally accepted facts within the aviation community, and have been more or less conﬁrmed by investigators, however quietly. The November, 2012 court ruling does not explicitly says so, but it is, in its own way, a tacit acknowledgment of the full story — one in which Continental Airlines played at worst a supporting role. This accident is an outstanding example of something we’ve seen time and time again in airplane crashes: multiple errors, none of them necessarily fatal on their own accord, combining and compounding at the worst possible moment to precipitate a catastrophe. Rarely is the cause of disaster something simple and unambiguous. Both British Airways and Air France, the only two operators of the Concorde, grounded their ﬂeets following the 2000 disaster. The planes were reintroduced following a fuel-tank redesign, but both carriers withdrew them from service permanently in 2003, after 27 years of service, citing prohibitively expensive operating and upkeep costs. Only twenty Concordes had been built, four of which were prototypes or pre-production examples. The Air France crash marked its only fatal accident. Concorde, as you may or may not know, was not the only supersonic passenger aircraft. There was also its Soviet cousin, the Tupolev Tu-144, which also suffered a single fatal accident over the brief course of its commercial tenure. In 1973 a Tu-144 crashed during a demonstration at the Paris Air Show. The Tupolev had taken off from Le Bourget airport, where Captain Marty and his crew were attempting an emergency landing when their Concorde went down in 2000.